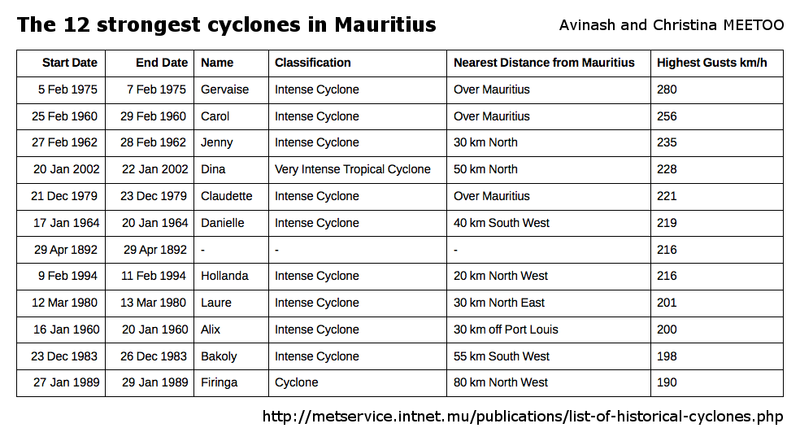 While browsing the Meteo Mauritius website, we found a list of big cyclones which have affected Mauritius since 1892. As I was born in 1973 and Christina in 1975, some of those cyclones evoked very distant memories: Gervaise and Claudette. Some, on the other hand, left a big impression on us when we were growing up during the 80’s and 90’s. I remember how strong the winds of Bakoly were. We had just moved to Quatre-Bornes and some of the small trees in my yard were bending over. I was 10 at that time and I was very afraid. Christina was living in an old wooden house with a corrugated iron roof and it was very scary too. The living room (varangue) had a lot of glass window panes and she thought that they could be shattered by the winds at any time. There were also huge trees in the yard and the atmosphere was very eerie. Firinga and Hollanda also made a big impression on our young minds. During the 2000’s, we had Dina which also caused quite a lot of damage with winds of 228 km/h. 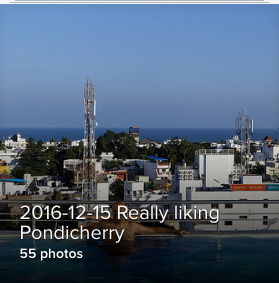 After one week in Kerala, we were ready to discover Pondicherry, a city once administered by France. Our Kerala driver, Mr Ajit, dropped us at the airport where we took an Air India flight to Chennai (we arrived only one day after the big cyclone they had had and we could see the large amount of destruction it had caused). 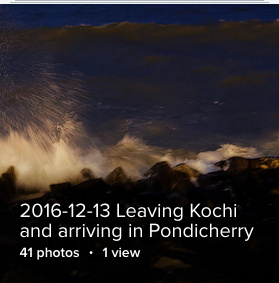 From the Chennai airport, we promptly drove to Pondicherry which is just two hours away. On reaching there, we realised that we had been booked in Hotel Athiti, a fantastic hotel and, as you can easily guess, we were quite thrilled as we were going to spend three days in the city. In the evening, we walked to the seafront and we were quite surprised to see that roads near the sea were closed to vehicles at night. A lot of people were walking, some were exercising and kids were having fun. We need to have something similar in Mauritius. We had a nice breakfast before heading to MG Road to do some light shopping. We witnessed some interesting scenes, in particular the very heavy and noisy traffic as well as the spectacular arrest by Pondicherry police of some men in a bar. What was interesting was that some of the policemen rode their motorcycles with the culprit sitting on the back seat. Some policemen, who didn’t come on motorcycles, stopped auto rickshaws which were passing by to drive them to the police station together with the remaining culprits. In the afternoon, after having a nice beer in the hotel which I had purchased in that same bar, we went back to the seafront and took some quite spectacular photos during the blue hour. 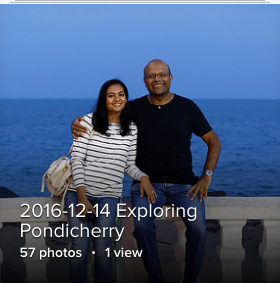 It is at this moment that Christina and I realised that Pondicherry was a special place and we could even project ourselves spending some months there in the future, probably when the kids will be at university. We discovered two beautiful churches in Pondicherry. At the Immaculate Conception Cathedral, we saw a priest conducting mass in Tamil with the audience consisting of mainly relatively old women in colourful sarees. We loved the subtly purple colours inside the church. The Basilica of the Sacred Heart of Jesus was also beautiful. We were impressed by the stained glass (vitrail in French) and the lighting. We walked from the basilica to a nice French café, le Café des Arts, to have a light lunch and a milk shake. On our way, we discovered the streets of the old French neighbourhood which contrasted quite sharply with, say, the noisy MG Road. We returned to the hotel and dived into the rooftop swimming pool from where we could see Pondicherry from above. And we also realised that this was one of the few places in South India where we could see a really blue sky like in Mauritius. At 8:30, we were at Keralaa Ayurveda to enjoy a full-body Shirodhara massage. The masseurs were all from Kerala and we were delighted by the warm coconut oil dripping on our foreheads. At breakfast, we had a last chat with the hotel staff, many of whom were from the northern Indian regions like Nagaland and Darjeeling. They were young people full of enthusiasm. We left Pondicherry for Mahabalipuram, an ancient historic city dating back to the first century. 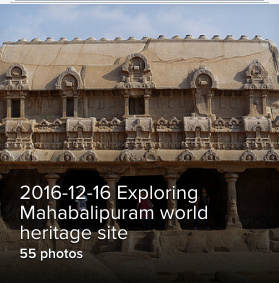 Mahabalipuram has a group of monuments and sanctuaries carved out of rock in the 7th and 8th centuries (temples, caves, open-air rock reliefs and the Shore Temple). The monuments have been classified as a UNESCO World Heritage Site. We headed back to Quality Inn Sabari in Chennai. We had already planned to spend the last few days in Chennai doing some shopping. In the middle of Pondy Bazaar, we stumbled upon a Kerala hairdresser where I had a nice haircut followed by a vigorous head massage (Kyan would have the same thing two days later). 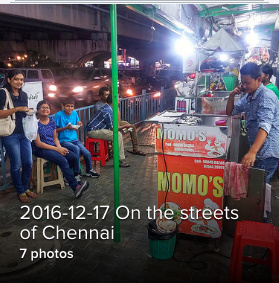 Before getting back to the hotel, we stopped at street vendors to have some delicious chicken momos and chicken curry wraps. It was the first time that we were eating on the streets in India and we were delighted at our prowess. A driver took us to Higginbotham’s as we wanted to buy some books. We were not very impressed by the bookstore but we did find some interesting books which are quite difficult to obtain in Mauritius. From there we went to Express Avenue, one of the largest malls in Chennai, where we indulged in some extensive shopping. 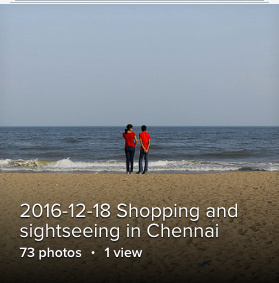 In the afternoon, we drove to Marina Beach but couldn’t find a parking spot. We settled on Elliot’s Beach, a few kilometers away, where we had a great time walking on the beach, witnessing some interesting scenes (people playing crickets, a few drunkards trying to swim and kids having fun on a boat). On our way back, we stopped at the Periyar Science and Technology Centre, not unlike our own Rajiv Gandhi Science Center, but on a larger scale. Unfortunately, time was short and we couldn’t see everything. We enjoyed the visit and the kids had a lot of fun. One interesting observation I made was that India is not afraid to work with different foreign countries to make things happen. For instance, its nuclear energy programme was done in collaboration with Russians (and so is its military aeronautical programmes). India also worked with the USA on some projects as well as European countries and China. This is something we need to learn in Mauritius: working with other countries when we clearly don’t master everything. 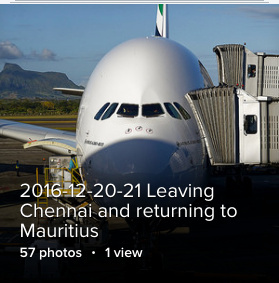 It is not only a question of making people come from abroad and do some work in Mauritius. It’s about working together and have a real transfer of knowledge and technology. 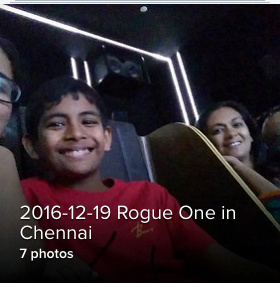 The new Star Wars installment had just been released the previous day and, because it was on a week day, we had excellent seats and we greatly enjoyed the movie including the 3D. 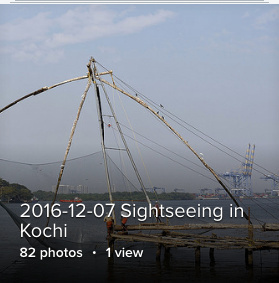 Interestingly, the ticket was just INR 150 per person, which is about Rs 90. A bonus was where Christina and I were seated: a comfortable two seater sofa. Our last day in South India was spent doing some last minute shopping, packing everything in our three suitcases and two backpacks and trying to sleep a bit as our flight to Dubai was scheduled at night. We left the hotel after having a very tasty dinner thanks to Mr Vasu, the maître d’hôtel, and his staff. They were instrumental in making our stay in Chennai enjoyable and comfortable. We departed from Chennai very late at night as our flight had been delayed and got to Dubai early in the morning. We did some shopping in the duty free shops there and took our final flight to Mauritius. We reached our beautiful island around 16:30 after spending a quite intense but very memorable three weeks in the South of Incredible India. 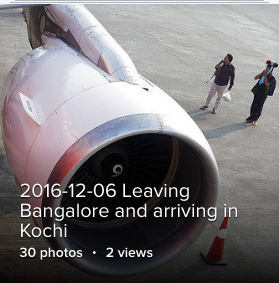 After spending one week in the states of Tamil Nadu and Karnataka, we left for Kochi in the state of Kerala on 6 December. Our friend, Dilip, was kind enough to drop us at the airport where we took an Air Asia flight. A driver, Mr Ajit, was waiting for us on arrival and he took us to our hotel, South Regency, in the middle of Kochi (also known as Cochin or Ernakulam). We were a bit tired so we just walked a bit around, had a nice dinner at the hotel and slept early. This was a very intense day. We started by visiting the Dutch Palace, then went to Jew Town to indulge in some light shopping and to visit the historic Jew synagogue there. At lunchtime, we had some nice sandwiches, burgers and salads at Café Crafters. We then visited St Francis Church where Vasco da Gama, the famous explorer, was initially buried before his remains were transferred to Portugal. Near the church were some beautiful colonial houses designed in a Dutch style. We walked to the seafront where we finally discovered the famous Chinese nets still used by local fishermen. We spent a lot of time watching them manipulating the nets and catching quite a lot of fish. 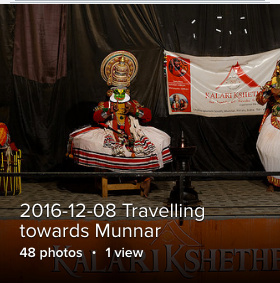 In the afternoon, we went to the Kerala Folklore Museum where we discovered Kerala art, especially masks worn by performers during plays. We were also quite amused to see small replicas of boys’ genital organs offered to Gods by aspiring parents wishing to have boys around 1000 BC (i.e. 3000 years ago). We left Kochi in the morning to drive towards Munnar. On the way, we visited an ayurvedic spice garden and bought a few ayurvedic oils. We reached our hotel, The Munnar Queen, early afternoon. Close to the hotel was a small theater where we attended a Kathakali show. This typical Kerala classical performance only features male actors, some of whom dress up as women, with large costumes and heavy makeup (not unlike Chinese opera as a matter of fact). The story was about a princess, her father the king as well as a villain. The exaggerated eye and body movements were fascinating. The live music being performed as well as the singing were also of very high standard. At the end of the play, Christina and I posed with the performers and we were very happy. After the performance, Kyan and Anya returned to the hotel while Christina and I tried a Kerala Abhyanga full-body warm oil massage. Munnar is well known for its beautiful tea plantations which are often featured in Indian movies. We were lucky to have an excellent weather on that day and we managed to capture beautiful photos. The kids convinced Christina and I that we should enact a typical Indian movie dance scene which we did with a lot of pleasure. We visited the Munnar tea museum, tasted tea there and had lunch which we had brought from the hotel. We then relaxed at Hydel Park, a nice and tranquil garden full of beautiful flowers and with a beautiful view of the Munnar tea plantations in the background. Later, the driver brought us to the Pothamedu viewpoint where the whole of the Munnar valley could be admired. In the evening, we attended a Kalaripayattu show, a Kerala martial art which dates from the 3rd century BC. We were amazed by the skills, the strength and the agility of the performers and we quickly realised that Kalaripayattu is as complex as Japanese Karate or Chinese Kung fu. Kyan was specially delighted and couldn’t wait to have his photo taken with the performers while putting on a menacing look (his words…). 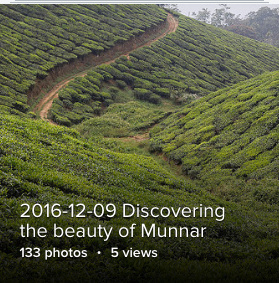 Munnar was really an important milestone in our trip. In Thekkady, we stayed at Spice Grove hotel, surrounded by a cardamom and pepper garden. 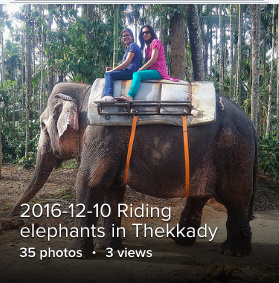 During the day, we rode elephants. Christina and I wanted to have a drink and we had spotted a beer and wine parlour attached to the hotel. But when we got there, we were quite surprised to see that it was more like a tavern with only men drinking. We quickly returned to the hotel where we had a very heavy dinner. However something didn’t agree with my stomach and I was a bit sick. 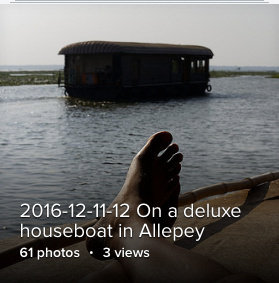 We checked in at a house boat called Ayodhya at noon. Our skipper, Vishal, and our cook, Vinod, welcomed us with a nice cocktail and, after setting sail, we had a wonderful lunch on board. We tasted typical Kerala food including the very well known Karimeen fish, fried to perfection. Anya got very lucky and managed to catch three small fish on her first fishing attempt. Kyan tried to emulate her but couldn’t. We sailed across the Kerala backwaters to a small village where we bought two big scampis (langoustines) to have for dinner. Vinod fried Anya’s three fish and she was delighted to share them with all of us. We greatly enjoyed the scenery, the birds and the beautiful sunset. Everyone felt very relaxed after ten intense days in South India. Vishal took us to another small village where we docked for the night as regulations do not allow boats to stay in the middle of the backwaters at night. We slept well as the boathouse had quite adequate facilities including air conditioning. The next morning, we had a substantial breakfast and sailed back to where our driver, Mr Ajit, picked us up to drive back to Kochi. There, we did some shopping in Jew town as we knew that we were going to leave the western coast the next day to go to the east of India.